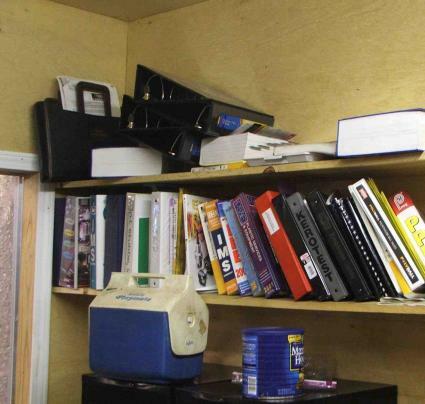 An overhead bookshelf is a special type of bookshelf. Bookshelves are present in almost every household, even when the household might not contain all that many books to begin with. It seems that there's simply no other alternative. Books cannot be placed in storage boxes or Tupperware containers, as easy access becomes an issue. They're too bulky to store in closets or under beds. For the many houses that have large numbers of books, simply finding enough space outside of large bookshelves seems impossible. There is, however, an alternative. Overhead bookshelves are sleek, modern, easy to arrange and adjust, and they make use of large amounts of space that might otherwise go unused. Why Choose an Overhead Bookshelf? An overhead bookshelf provides the easy access that many bookshelves cannot. For instance, books must often be accessed at the home office when writing reports, or when high school and college students are hard at work on papers. Adding overhead bookshelves to the area above a computer eliminates the need to walk away in order to access your library. When space management becomes an issue in houses with little floor area, overhead bookshelves can also make use of untapped wall space. Bookshelves are often large and, positioned in the middle of a room, can seem clunky. Overhead shelves, by comparison, are modern-looking. One of the greatest advantages of an overhead bookshelf is that installation is inexpensive and nearly effortless. The only tools required are often a drill and a level. Hollow-core interior doors make easy and rather attractive bookshelves, and can be found lying around or purchased for $20 or less. The shelves may be held up by cleats inserted into wall studs, or reinforced by brackets made of half-inch electrical conduit. Just about anyone can gather the materials and build a set of overhead bookshelves in an hour's time or less. When compared with traditional bookshelves, this is quite a deal. Even if a bookshelf is pre-made, and brand new ones rarely are, transporting it to your home and moving it into the proper room takes time and often a monumental effort. All that time could be saved installing overhead bookshelves directly on walls. Bookshelves installed on walls in studies and computer rooms have the advantage of looking modern and classic at the same time. A row or two of shelves with decorative bookends may appear cutting-edge or even avant-garde. Some individuals might prefer the "library look;" that is, taking the predominant amount of space on one wall in a room and converting it into a series of bookshelves. Either way, several feet of floor space at a bare minimum will be saved from a bookshelf that just gets in the way. Unfortunately, a poorly installed bookshelf can have disastrous results. If screws are not properly inserted into studs, these shelves can collapse, taking a nice piece of wall along with them. The risk always exists of books (or worse yet, a heavy bookend) falling on an individual's head and causing serious damage. While overhead bookshelves look sharp to some people, others might find them tacky or ill-fitting in the décor of their home. These individuals might prefer a large, sturdy bookshelf on which to keep their books--and for these people, of course, a full bookshelf usually works just fine. In the end, installing overhead bookshelves is largely a matter of taste. However, it stands to note that the benefits of overhead bookshelves will, for many families and individuals, outweigh the drawbacks. Give overhead bookshelves some serious thought. Does your house need more storage space for books? Are there certain rooms that would benefit from overhead shelves? Are you willing to put in the time and effort necessary to install them yourself? Once you've considered your needs, you'll have a much greater indication of whether overhead bookshelves are up your alley.